In the sea of home appliances and vacuum cleaners, the Shark NV501 Rotator Professional Lift-Away Upright Vacuum Cleaner is the hero. The Shark Rotator Professional Lift-Away 3-in-1 Upright Vacuum is especially popular among health-aware families and responsible pet owners. 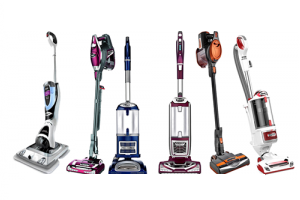 Variety of features keeps it up in line with some of the best shark vacuums out there, with thousands of successful purchases already. An overview bellow will give you a more detailed look into the Shark Rotator Professional Lift-Away 3-in-1 Vacuum Cleaner. As the lengthy name of Shark NV501 Rotator Professional Lift-Away Upright Vacuum Cleaner says, it’s a 3-in-1 vacuum cleaner. This means, you can use this shark vacuum upright by carrying the canister or by placing the canister on a “caddy”. Although the design of the shark upright vacuum cleaner wasn’t a big win among the buyers; the other features make it a real competitor. The shark rotator canister is large enough to be efficient and still remain comfortable to carry. The Shark NV501 Rotator Professional Lift-Away Upright Vacuum Cleaner detaches from the base with a simple press of a button. And it’s equally easy to place it back. Also, you can use the caddy to place the canister and more around with ease for the more demanding clean-ups. The Shark NV501 Rotator Professional Lift-Away Upright Vacuum Cleaner cord is 30 feet long. With this cord, you can freely move to the sound of your favorite clean-up jam. The cord length would be a double feature if it had an automatic rewind system. But sadly, this best shark vacuum skips on it. However, the shark rotator vacuum cleaner features are great for large, tricky areas or for longer periods of cleaning. All in all, the parts click nice and easy together. This means you can start using your new shark rotator vacuum cleaner without any fuss. There are a lot of upright vacuum cleaners now that have similar characteristics. But the first noticeable feature of Shark NV501 Rotator Professional Lift-Away Upright Vacuum Cleaner is the LED headlights. The light makes the cleaning easier on many levels, especially for all the night-owls. It will provide you with additional light and enable cleaning of the most remote corners. The Swivel Steering gives you an excellent control over the cleaning area and helps you reach the tricky ones. The Shark NV501 upright vacuum cleaner cuts your cleaning time at least by half and increase its efficiency. Due to its Anti-Allergen and HEPA filters, this Shark Rotator upright vacuum cleaner is a friend for many asthma and allergy sufferers. Together, they collect around 99.9% of particles like dust and pollen. Then they trap and seal them in the vacuum cleaner. In addition, Shark Rotator vacuum filters are washable and durable, with an average period of 3 months between washes. These Shark Rotator vacuum filters are great for your health family because it keeps you safe. Even from the smallest harmful particles. Other than the Shark Rotator lift away filters, the Shark upright vacuum includes a set of shark accessories. The Shark Premium Pet Power Brush picks up pet hair and debris. It makes sure there’s no dander left on surfaces. This is a lifesaver for owners of furry pets. Also, there’s a crevice tool, dusting brush, the wide upholstery tool, and of course - the canister caddy. If you buy the premium deal, the package may also include an accessory bag and an under appliance wand. The variety of the Shark Rotator Lift Away Accessories means that this upright vacuum cleaner is friendly to any carpets, tiles, hard wood floors. Actually, this upright vacuum cleaner has such a good seal on the floor that snowplow effect is almost unavoidable. What’s great about the Shark Rotator Professional Lift Away 3 In 1 Upright Vacuum is that it’s pretty low on noise. This feature is great if you have young children, timid pets or easily annoyed neighbors. EURO-Pro 3 years limited warranty if you buy Shark Rotator through Amazon. With its customer care service and a wide range of products, Shark is a leader in the floor care department. In a recent study, 3 out of 4 British people say Shark Rotator Professional Lift-Away 3-in-1 UprightVacuum Cleaner is one of the favorite models. In fact, it is the best rated Shark vacuum cleaner so far. If you look up the Shark NV501 Rotator Professional Lift-Away Upright Vacuum Cleaner on Amazon, you'll see that it has great user reviews. And pretty stellar marks from more than 2000 people, mostly because of its remarkable features and adaptability. With Shark NV501 Rotator Professional Lift-Away Upright Vacuum Cleaner portable, cleaning has never been easier. With a press of a button the weight of the vacuum cleaner doubles down in seconds. Shark Rotator upright vacuum is easy to use and navigate. Great for pet owners, people with allergies and asthma. Shark Navigator Lift Away vacuum reviews tell you that Shark ﻿Vacuum is not just another cheap vacuum cleaner. And you ? Have you already bought and tried Shark NV501 Rotator Professional Lift-Away Upright Vacuum Cleaner ? If so, do not hesitate to share your best shark experience with us.